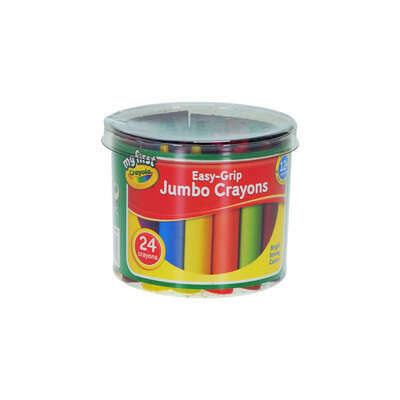 Designed for younger children, these Crayola My First Jumbo Crayons are perfect for drawing and colouring. They are provided in a range of bright and bold colours. Each one is made of non-toxic wax with a sturdy design to prevent snapping. The easy-grip, extra-large design of these jumbo crayons allows them to fit into children's palms to make their very first colouring experiences easy and enjoyable. Suitable for children aged 12 months+, these Crayola My First Jumbo Crayons are an ideal way of introducing toddlers to colour exploration. They can also be used to develop physical and cognitive skills along with hand-eye coordination. We have a wide range of Crayola products available on our website alongside the My First Jumbo Crayons. These sit in our Arts & Crafts category alongside items such as White Card or HB Pencils, all at exceptional wholesale prices.